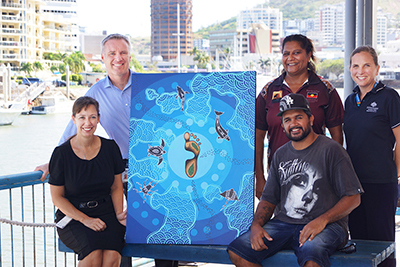 A local artist’s stunning acrylic on canvas piece will be showcased on the cover of the Great Barrier Reef Marine Park Authority’s first Reconciliation Action Plan — scheduled for release later this year. Titled ‘Step of Change’, the work is a creation of Nicky Bidju Pryor, a Juru Traditional Owner from the Burdekin-Bowen area and a descendant of the Birrigubba and Gunggandji nations. The artwork features traditional depictions of marine life and a symbolic ‘step forward’ set against waves of striking blues and teal. Great Barrier Reef Marine Park Authority reef protection branch general manager Dr Simon Banks said the artwork was selected from a wide range of high-quality designs submitted during an Expressions of Interest callout earlier this year. Mr Pryor said the Great Barrier Reef played a significant role in his life, having spent part of his childhood enjoying various forms of fishing and educational activities with his family. “As an adult, I have been on conservation trips with family to learn more about turtles and what is being done to conserve our Traditional Land,” he said. Teal lines – represent recovery and the Reef coming to life. Mr Pryor's artwork will be displayed in a prominent location in the Marine Park Authority’s Townsville office to emphasise the commitment of the organisation to reconciliation. Reconciliation Action Plans are strategic documents that include practical actions that will drive an organisation’s contribution to reconciliation both internally and in the communities in which it operates. From left: Marine Park Authority Senior Project Manager Rachel Reese and Reef Protection Branch General Manager Dr Simon Banks, artist Nicky Bidju Pryor with his work ‘Step of Change’, Marine Park Authority Indigenous Compliance Manager Peta Rossand Special Projects Manager Eliza Glasson. Image: Great Barrier Reef Marine Park Authority.